Imagine what a Northern California garden might look like 100 years from now as temperatures keep rising. Where lush grasses, riotously bright California poppies and quaking aspens once stood, picture -- what? Cracked earth, tumbleweeds, cactus and giant cockroaches, maybe? A group of artists and scientists at UC Santa Cruz (UCSC) have a different vision for the California landscape of the future, and they’re starting to prepare for it now. Part science experiment and part art installation, "Future Garden for the Central Coast of California" aims to discover which plants are most likely to survive escalating temperatures and can help regenerate the regional ecosystem as climates shift. 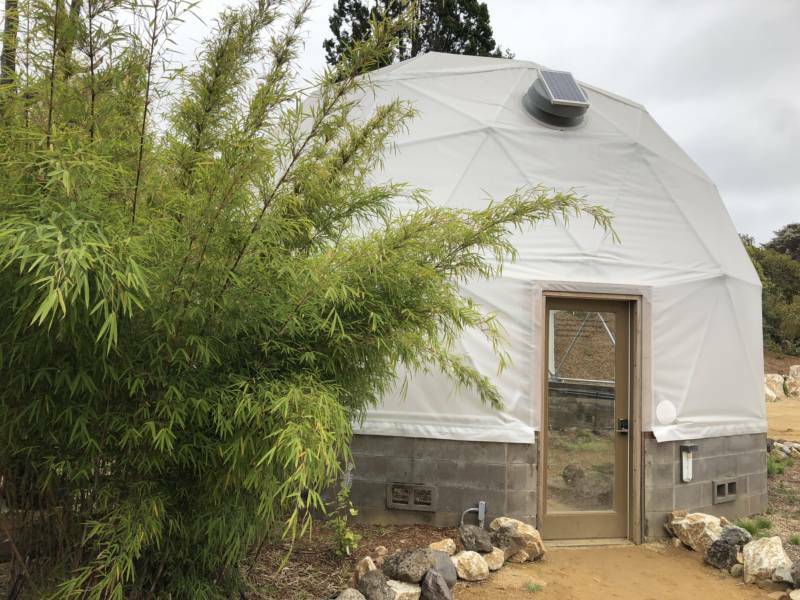 There are 16 different species of plants in each of the three restored, 1970s-era geodesic domes at the UCSC Arboretum and Botanic Garden. The plan is to accelerate the process of climate change inside the domes to find out which species are more resilient over time. The process is going to take a while; the recently-installed project is expected to last 50 to 75 years. "We're assisting the migration of species through time," says Santa Cruz-based environmental artist Newton Harrison, who co-created the project with his late wife Helen Mayer Harrison and other science and art partners at UCSC. The world-renowned artists, who in 2016 became the subject of a beautifully-illustrated tome published by Random House, and whose archives are housed at Stanford University, have been making environmental artworks on a global scale since 1969. The Harrisons' work mostly takes the form of installations, writings and large-format wall maps. And it has brought them both fame and notoriety over the years. One the one hand, they inspired a branch of the Dutch government to change its approach to urban planning as a result of their Green Heart of Holland project; on the other, they caused political uproar in England during an exhibition at London's Hayward Gallery involving the electrocution of catfish. (The controversy was later transformed into a chamber opera.) 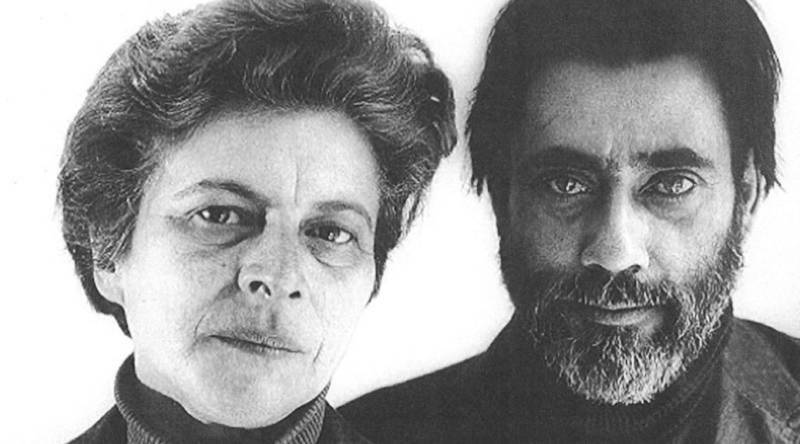 You can read and listen to a KQED profile of the Harrisons and their epic career here. 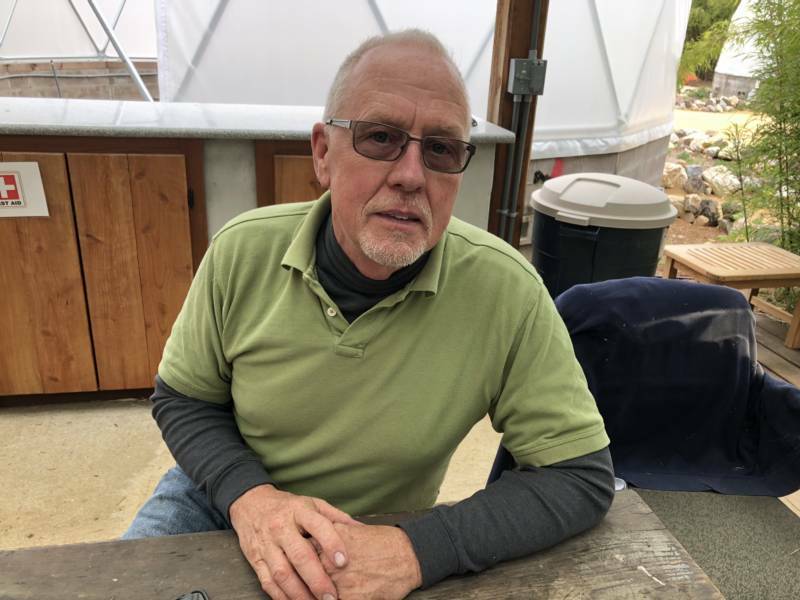 The inspiration for this latest project at the UCSC Arboretum came more than two years ago, when the Harrisons happened to stroll past the three, then-decrepit domes and saw an opportunity to renovate and convert them into testing grounds for local plants facing the effects of climate change. "Nature is pretty opportunistic," Harrison says. "And artists are pretty opportunistic, too." 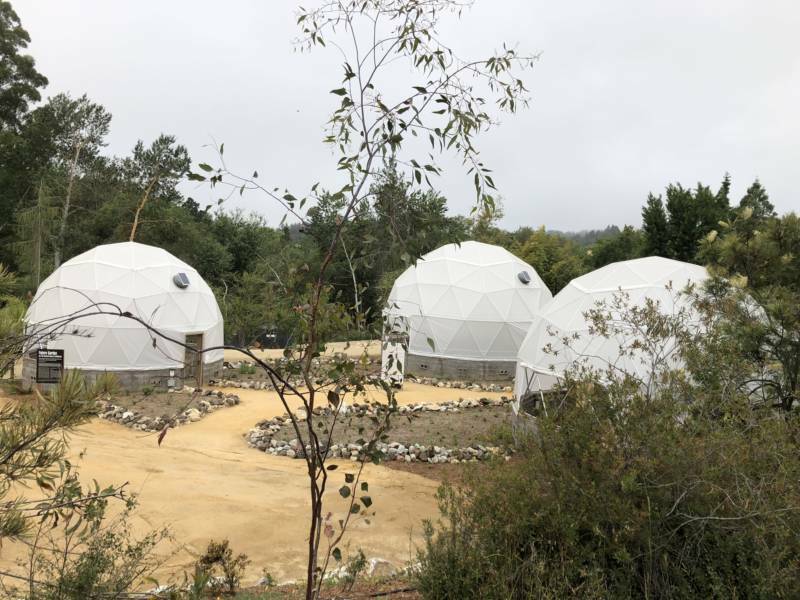 "Two of the domes had been completely shut off and empty and one of them was being used for a crafting group," says Martin Quigley, executive director of the UCSC Arboretum and the Harrisons' main collaborator on the project. "All of them were in very bad repair. So this has revitalized the whole area." There's new fabric on the domes, and a fresh, stable framework, plus new landscaping all around the area. Each Future Garden dome houses an assortment of 16 native plants, chosen chiefly for their likely resilience in the face of sudden, drastic temperature and water fluctuations. Species on display include yarrow, fescue and coyote mint. 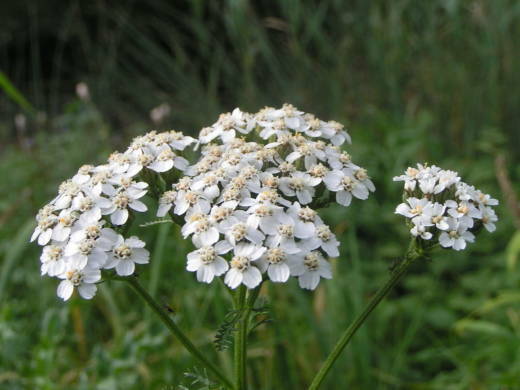 Some of the plants are edible. Some have medicinal properties. Many have also been a staple of Native American life in the region for thousands of years. 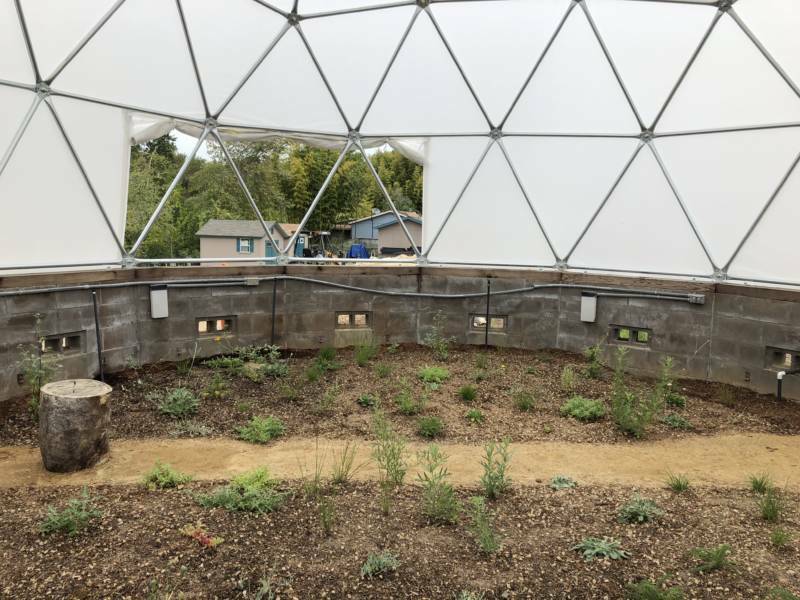 After a year of establishing the plants, the project team members plan to start playing with the conditions inside each dome. One dome will experience heat spikes in summer months and less than normal rain during the winter, similar to a continental desert. One dome will mimic coastal temperate conditions in the Pacific northwest, with ambient temperatures and summer rainfall. The third dome will experience both heat and water spikes amid warmer than average temperatures, mimicking subtropical conditions. Outside the domes, the same species have been planted in small walled gardens around each dome to provide a set of control experiments. "Climate change isn’t about a slow steady temperature increase," says Quigley. "It's about spikes and randomness that increase. And because these domes are smallish, it's very easy to manipulate that in a strong way." Future Garden is part of a larger, ongoing investigation by the Harrisons into the survival of species in the face of climate change, entitled The Force Majeure. The Harrisons co-opted the legal term "force majeure" for this body of work, which means a huge power that cannot be controlled, not unlike the fast-encroaching water levels and rising temperatures we're experiencing on the planet today. Another Force Majeure project, at the University of California Berkeley’s Sagehen Creek Field Station in the Eastern Sierra Nevada, is already starting to see results. For the four-year-old installation, artists collaborated with field station scientists to physically move groups of plant species to different altitude levels. The aim is to help seedlings -- such as wild rose and red fir -- become resilient to the warming effects of climate change. "We found something rather astonishing, after drought and all the other problems it could possibly have," says Harrison. "Of the 21 species we installed, about six -- or 25 percent -- live at all levels. That's success." Although he has reason to be mildly optimistic, Harrison continues to worry about what our hot, dry future might look like. 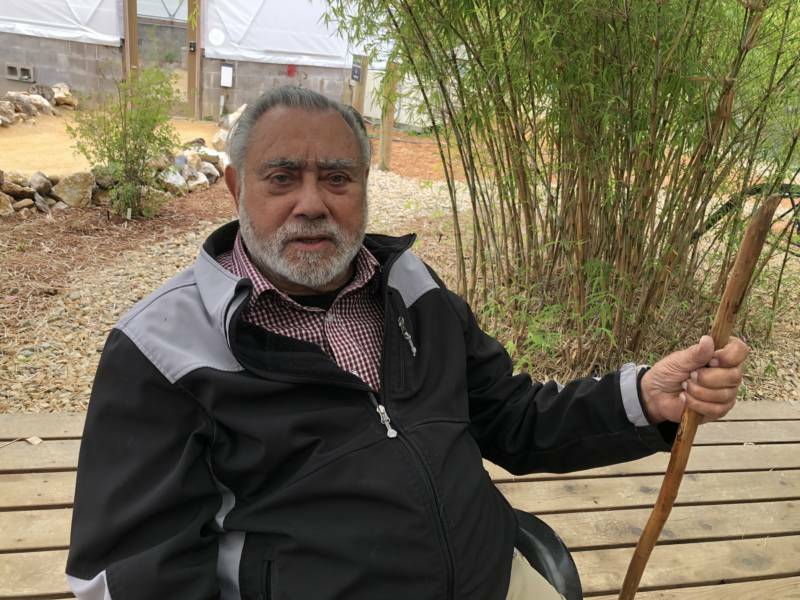 And though it's a controversial idea, he believes finding a way to help a few, hardy species learn to become more adaptable to rising temperatures is ultimately more likely to succeed than trying to save many already-endangered species from dying out. "An awful lot of the experimentation that receives grants aims to save the most endangered species, which if the temperature gets hot enough, are not inherently savable," Harrison says. "We take exactly the opposite position. We look for the most resilient species." "Future Garden for the Central Coast of California" is presented by UCSC's Institute of the Arts and Sciences.